The goal of the Virginia Department of Health (VDH) Food Safety program is to ensure the proper handling of food served to the public by working with restaurant operators to reduce risk factors involved in foodborne illnesses. 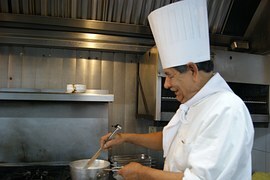 VDH collaborates with food establishments to provide safe and satisfying food service to the people of the Commonwealth. 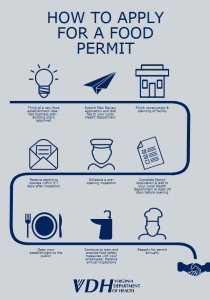 Here, restaurant owners, operators, managers and even employees can find details about permitting, inspections, training and other resources about food safety. If you have a question about your food establishment that cannot be answered here, don’t hesitate to contact your local Environmental Health Office or Ask the Food Safety Experts. Together, let’s make Virginia the best (and safest!) fed state! By July 1, 2018, food establishments (including temporary food establishments) will need to have at least one employee with supervisory and management responsibilities and the authority to direct and control food preparation and service who is a Certified Food Protection Manager (CFPM). Learn more about this requirement here. Contact your Local Health Department for district-specific requirements in applying for a permit to operate a food establishment. 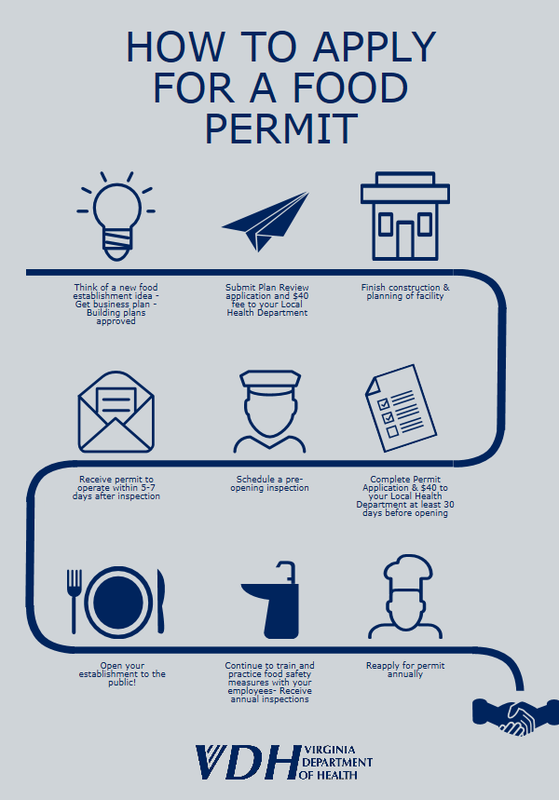 You may download a food establishment permit application here: Foodservice Permit Application. If you are interested in applying for a permit for a temporary event, please visit our page on Temporary Food Establishments. 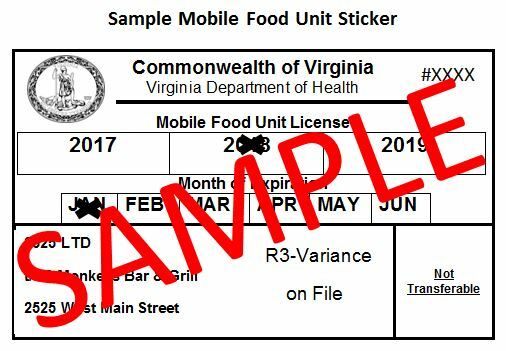 Effective July 1, 2017, the Virginia Department of Health is now required to issue mobile food unit licenses in the form of a sticker that shall be prominently displayed on mobile food units. 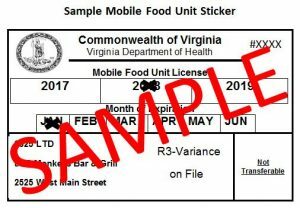 This change was enacted due to the passage of House Bill 1625 during the 2017 Virginia General Assembly legislative session.For more information, please refer to our fact sheet on Upcoming Changes for Mobile Food Units. In 2018 the Department of Housing and Community Development passed requirements for fire safety specific to mobile food establishments. You may find a handout to assist mobile food unit operators here.